Welcome, SQL University Students to another extension class here at Miskatonic University, home to the Fighting Cephalopods (GO PODS!). Never mind the stains on the floor, or the walls…or those really nasty ones on the ceiling. There was a… oh what did the dean call it… an incident last week when one of the students had a little accident after reading Die Vermiss Mysteriis one too many times. But we’re not here to talk about arcane tomes and unspeakable horrors today. No, today we’re here to talk about clustered indexes. What about the fact that the default primary key is clustered? Think that was by accident? How about the fact that when you create a clustered index, it becomes the data? Isn’t it interesting that you create a materialized view, an indexed view, by creating a clustered index? Do you think that the fact that all non-clustered index key values point back to the clustered index is significant? Ah, a key lookup. The most common query on the system and we’re paying the cost of a key lookup operation, each and every time. Ask yourself, could this column support an index? Since it has one, yes, it’s selective enough to support an index. Could we change the non-clustered index to make it covering? Maybe, but why do that when we could just modify the cluster and achieve good results since this is the most frequently access path to the data. Just remember that if a clustered index is not unique, SQL Server will add a value, called a uniquifier, to make it so. This could be another consideration when determining where and what to cluster. Right, the cluster still only has 3 reads, but now you’re back to 11, or more, on the heap. 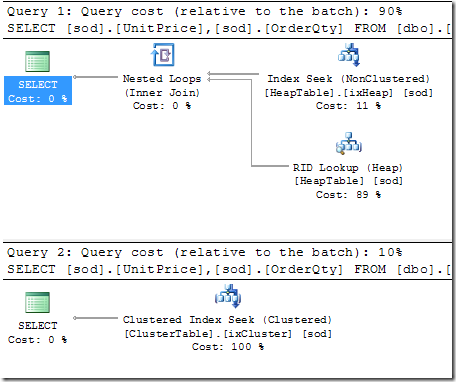 This idea behind this post is to simply get you to think about your clustered index. There are endless debates about the exact, most perfect, method of using your cluster. My take is rather simple. You’re better off having one than not. Since you have to have one, make sure the system is using it, so place it on the most frequently access path that is also selective enough to support an index. I’ll leave it to the experts to debate the finer points. See you for the next class in a couple of days, assuming no disruption in the space/time continuum or elder gods ripping apart the planet. Thanks! Had to come up with a “scary” hook, hence Miskatonic University. Thank you for the very informative, clear and nice to read SQL University series of blogs.